You are here: Home / Dog Training / Nothing In Life is Free: Should Dogs Have to Earn Affection? Nothing In Life is Free: Should Dogs Have to Earn Affection? Laika might have to work for a lot of things in life, but my affection isn’t one of them. 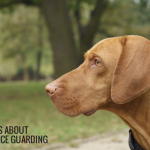 Do you practice the Nothing in Life is Free protocol with your dog? When I first got Laika it was recommended that we adopt that philosophy for everything. I was told it would make my dog more confident and well behaved. Now I don’t disagree that it works well for many training exercises, but there was one part that made me think twice. The more I looked into NILF the more I realized I disagreed with one of it’s main principles; that my affection was a resource not be given freely. What do you think? Should dogs have to earn affection? What is Nothing In Life is Free (NILF)? Nothing in Life is Free (NILF) is a dog training protocol that requires your dog to obey a command or cue before he gets something he wants. The command you use can be whatever you like, but the key is to remain consistent. The most important part of NILF is that the dog only receives what he wants after the command has been obeyed. Food, play, petting, and toys are all resources your dog desires. When you follow the NILF protocol you need to establish yourself as a strong leader, so you must make your dog earn his rewards. In NILF your dogs reinforcements are strictly controlled and delivered after your dog has worked for them. As with any dog training protocol the level of commitment and consistency can vary with this method. In the most extreme cases NILF is explained as being important to better establish yourself as the pack leader. NILF is excellent at training consistency in us humans. We often forget that we’re always training, whether we realize it or not. Does your dog follow you around everywhere? When he does do you give him any positive reinforcement like a nice pat on the head? I know I do. So it’s no surprise to me why my dog Laika is quite the velcro dog. Dogs excel at consistency and routine. If something works for them they’ll try it again. Did begging for that strip of bacon work last month? If it did it’s likely to work again someday. This is where NILF reminds us about the importance of consistency and expectations. I don’t disagree that our dogs should know what is expected of them. I reinforce desirable behaviors with positive reinforcement. It helps communicate with Laika when she’s made a great decision and she’s more likely to repeat that behavior later on. And like all training that remains consistent I’ve gotten great results. Before we go on our daily walks Laika retrieves her leash for me. It’s a simple job for her to do while I get ready, and more importantly it helps keep her focused instead of spinning around in circles with excitement. When visitors come over she doesn’t get to greet them until she sits and remains calm. Before she gets her meals she must sit. It’s not a bad idea for anyone, but with Laika it was extremely important because of her severe resource guarding. Before she’s let off leash she must sit and wait patiently for a moment. There’s lots of little things she has to earn in life, but I’ve never made affection one of them. Laika and I tend to follow along the “Say Please” protocol rather than sticking to NILF. When I look at that face (and those ears) I can’t resist giving out free affection. Should Dogs Have to Earn Affection? I have two problems with the NILF protocol. The first is the basis in pack mentality. Not all people who use NILF see themselves as alphas, but it’s pretty common theme in the protocol. Sure I make my dog do certain behaviors before we go for a walk or eat, but it’s not so I can reinforce myself as her leader. I do it because it keeps her focused and calm. The second problem is calling affection and play resources that need to be earned. I have a dog, man’s best friend – known for being loyal and affectionate by nature. I don’t mind giving my dog affection, and I don’t think she should have to earn it. And that doesn’t mean I give my dog affection when she’s being bad, it just means that I don’t make her work for my affection. I reinforce behaviors that I find important, and yes I do lack in the consistency department from time to time. But for the most part Laika makes for an excellent companion. We’ve worked out the important behavioral issues. We train a lot, so at the end of the day when I climb up on the couch and Laika joins me freely I don’t mind a bit. And sometimes when Laika comes up and nudges my hand it’s a great reminder that yes, I have been watching funny cat videos a bit too long. I’m not going to pretend as if I know how my dog’s brain works, but I assume that giving her affection “freely” isn’t harming our relationship. To ask a companion animal to work for such affection seems a bit harsh. Giving affection is a natural behavior amongst creatures that share a bond, it’s not something I consider a resource. 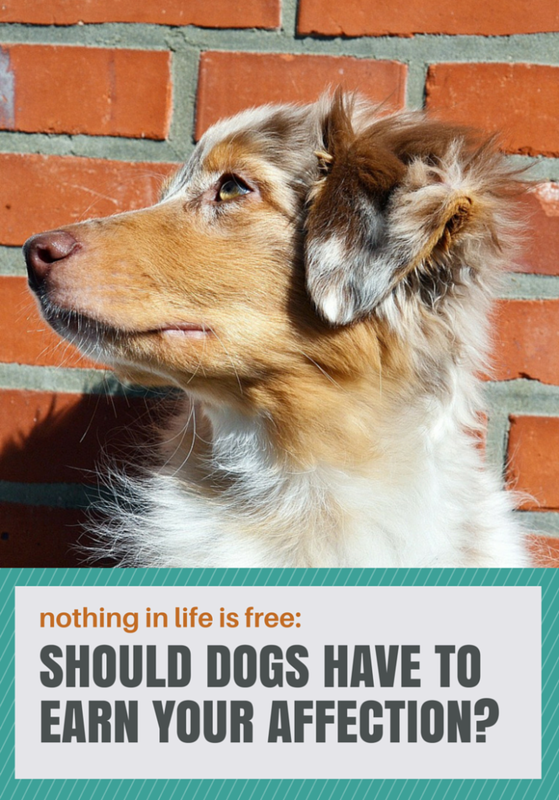 I was thrilled to find out that the great dog trainer Kathy Sdao shares the same philosophical problem with the Nothing in Life is Free protocol as I do. She wrote a book called “Plenty In Life is Free” that discusses the stifling rules that constrain a person’s ability to share affection with their dog when following the NILF protocol. The Positive Training Blog Hop is hosted by Cascadian Nomads, Tenacious Little Terrier, and Rubicon Days. February is Responsible Pet Owners Month so you’re invited to join in and share your positive training tips. Nothing in life is free: should dogs have to earn your affection? It just seems harsh to withhold play and affection – it’s just something that comes so naturally. And I love the sentiment that they deserve it whether they’ve earned it or not lol. Whether I’d subscribe to the NILIF idea or not I was never able to being myself to not giving out free. Love and affection. While the guys need to earn other things, affection is free in our house. I don’t do NILIF either and I really liked Kathy’s book, too! I do lots of things for free. I’m kind of a “Never Say No” dog parent. I’ve been meaning to read Plenty in Life is Free. Oh, Kari – I’m surprised you haven’t! I think you will love it. I completely agree with you. While I definitely ask for a sit before treat time, feed time etc…I do not make them work just for me to pet them or give them attention. It even sounds cruel to do so! NILF kept Freighter from being rehomed last summer. I guess it depends on the dog, but for some dogs I think it is a great training tool. You see Freighter was a carefree puppy. He never really pushed the envelope so we just went along. When he got to 2 1/2 (maturing) he tried to be head of the house hold over us humans. It was surprise because he had had so much training. He was great hunting, hunt testing, in the show ring, on a lead, with strangers; but with us he was becoming a problem. It was because he thought he should be head of the pack (not uncommon with a Chessie and all of his littermates went through the same thing at the sane time so in retrospect it was a maturing thing and not a temperament thing but at the time we did not know that). He mixed it up with Thunder and Storm. Well OK they have to figure it all out between them, but with us it was an issue. So what to do? He could live outside. We could beat him every time he acted out (just being positive was not working like at all). We could rehome him. None of those were a great solution. So we turned to NILF and I will tell you it wasn’t but a month or two before the light bulb went on in his brain. He now understood he was a dog and not the ruler of the house. He became a happy pup again, content to be a dog and let us lead. While we still separate our two intact males and Storm because she beats him up and he won’t take that…lol… they are not constantly growling at one another. We really don’t practice it that much anymore. The reason the method works is because it changes the dynamic between person and dog. The dog no longer calls the shots. Not catering to a dog does not mean that the dog is not loved. It would have broken our heats to give him up. The dog just learns that there are boundaries to his interactions with humans. ALL dogs should learn this. All dogs! and in whatever way is appropriate for that dog. NILF really is effective and I think if more people practiced it, less dogs would end up in a shelter. Wow thank you for sharing. The amazing thing about NILF is the consistency, focus, and attention it creates for both dog and owner. Luckily Laika’s issues haven’t been very serious so our ‘say please’ regimen works for most behaviors. I completely agree that all dogs are individuals, and I can see the benefits of NILF. It’s just something that didn’t feel right with Laika. I’m so glad it worked so well for Freighter, I didn’t realize he had been such a ‘character’ last year.. geez. I couldn’t imagine having to be in your situation, it’s the reason I won’t adopt another dog while I have Laika since she’s the jealous/guarding type I could see a lot of potential problems. And as you say what do you do? Let them live outside? Crate and rotate? There’s no easy solution. I’m so glad it worked out for him, and it’s a true testament to how sticking with a training protocol can work wonders. Oh he was a PITA last summer. But as I said thankfully he got over it. 🙂 Thank goodness because he really is the whole package as far as genetics and Chessies go. Has all health clearances, good in the field and a threat in the show ring and very very smart. I never really related NILF tot he pack leader mentality, but it completely makes sense after thinking it through. Mauja and Atka certainly don’t have to earn my affection. They are family members and you show love to your family freely. However, they do have expectations of them. Like sitting and waiting before meals, walks, etc. Great post, and I agree 100%. I am a huge fan of making Buster wait for a command before eating and running out the door, but I agree that affection is an entirely different thing. I almost feel that making them work for affection could be detrimental to your bond. I mean, how many times is your dog coming to you for affection but you don’t have treats or time to make him sit and wait, but you could just pet him a few times if you didn’t make him work for it? That’s a lot of potential missed opportunities to strengthen the bond. I love it when my dog runs up to me full force to snuggle. I wouldn’t want t miss out on it. I also don’t agree with the alpha mentality, so I’m sure that’s a huge part of it. I agree – it just doesn’t feel right to me to withhold affection. In my mind it’s completely separate from traditional ‘resources’ such as food. Great post! I definitely agree that affection isn’t something my dog must earn. Our unconditional love & affection is what they deserve, we owe them at least that. I do believe our dogs should work for treats, toys and certain other things; I agree that it keeps them focused and well mannered. The NILF program would not be in line with my style, it’s a bit too strict for me. The NILF methodology just doesn’t mesh with my personal style. I want to be my dogs’ protector and playmate, not their dictator. Kathy Sdao’s book really resonated with me. A friend of mine told me that after training several dogs “traditionally,” which is to say with harsher methods many years ago, she decided to take a different approach with a new dog. She did very little formal training and simply engaged with the new dog every time he asked. She said it formed an incredible bond. I’m so glad you picked this topic and thank you for joining the hop! Thanks for hosting such a great hop, I love seeing all these amazing posts on training techniques and challenges. I agree – I find nothing wrong with the basis of consistency in NILF, but I didn’t find that it really felt right for us. Love this! When I had a doberman I tried the Dominance-Based Training method and I believe it worked for him, when I got another doberman that method didn’t work for her. I had to try new methods and figure out how best to make her fit into our lives more cohesively. I wish I had known then what I know now. Anyway, I loved my dobies and miss them dearly. I now have a cavie who is super easy compared to my previous dogs. If I made him work for affection he would be sad all the time. But he for sure loves to learn and “work” for treats. Thanks for your post. It’s so amazing how individual our dogs are – the training methods I’m using now didn’t work so well with my last dog. Laika is much more sensitive so everything has to be positive. And yes I agree I’d find it hard to make my dogs work for affection, it’s just something I’m willing to give out freely. Thank you for sharing. I’ve always thought of the NILF method working well as a short-term program for adopted or fostered dogs that were out of control pushy due to no structure or training by previous owners, but I can’t imagine always relating to a dog with the concept that everything must always be earned. Excellent post. And I agree with you that the major problem with NILF is the underlying philosophy some people bring to it. 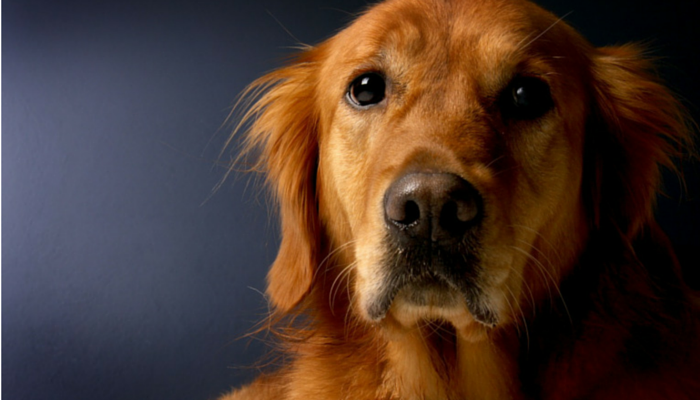 The problem isn’t in asking dogs to do things in exchange for getting something they want. It’s in the assumption that we’re not involved in a two-way relationship with our dogs. For safety’s sake, I need to always be in charge in some ways–like deciding when Honey can be off or on leash. But there’s no reason I need to set myself up as some kind of god doling out affection like it’s water in a desert. Glad to see you kicking back. And I’ve been meaning to read Kathy Sdao’s book. You’ve given me the push I needed. I treat each dog a little differently but of course I dish out all kinds of affection to all dogs. I really liked this post and it seems like you have a lot of the same beliefs I do. If a dog tends to be more demanding or “status seeking” that’s when I would make him work harder for certain things but that doesn’t mean the dog has to always “earn” affection. That being said, I think the “nothing in life is free” model of training is a pretty easy model for new dog owners to get behind, and it can be really effective. It just doesn’t need to be taken to extremes. Thanks, and yes I definitely agree that depending on the dog we need to modify our training methods. I’m so lucky to have a dog like Laika that responds well to some pretty simple reinforcement. Positive reinforcement training for a great number of dog sports over the years has taught me that my dogs and I are a team. They don’t need to be dominated or deprived to learn or be great at their jobs. 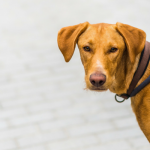 However, each dog is different and there are certain aspects to NILF that have helped me solve certain behavior problems in my often stubborn Chesapeake Bay Retriever mix and dachshund. One example of NILF like techniques I have used were in teaching Wilhelm to stop jumping up on people. This was an annoying habit but also very dangerous for his long back. He knew he was supposed to sit to greet people but that would last for barely enough time for a click, for years. The back turned away from a jumping dog is a NILF technique but that wasn’t enough to get Wilhelm recomposed into his polite sit. It actually took very strict consistency in ignoring him completely upon meeting to get him to finally gain the self control to remain seated and be greeted. Honestly, not greeting him had me fighting back tears at times but he is now 99% perfect at greeting me and everyone with a very politely waiting sit. He is also seven years old and has no signs of back or hip problems. So while not my preferred method of training, it worked and I am very thankful for that. Thank you so much for this excellent, thought provoking post on a great subject for the Positive Pet Training Blog Hop. I hope you will join us again! Thank you so much for sharing, and yes I’ve done the same and had to modify different techniques depending on the behaviors I’m looking for. NILF is great at keeping us humans consistent, but it’s not going to work on every dog for every behavior. 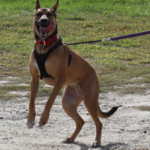 Laika had a habit of jumping up as well, so we had to work on the ignore method for a long time. Glad to say she’s finally stopped that and can now remain (somewhat) relaxed when visitors come over. 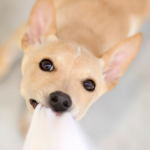 Thanks for hosting this hop, I really love the topic and it’s wonderful to read everyone’s perspective on a wide variety of topics related to responsible pet ownership. I’ll definitely be joining again. I guess the rule in our house is as long as Mr. N is well-mannered and not pushy about it, and does what he is told, he gets what he wants (within reason!). And he understands the “not now” cue. We practice some form of training with just about all the food he gets but a six-pound dog can only eat so many calories. It’s hard enough to try and count calories for a large dog, I couldn’t imagine trying to do it with Mr. N. I should have a ‘not now’ cute, that’s a brilliant idea. We practice NILF most of the time, but affection is handed out freely and generously from all ends.